True to its title, Maximalism is a trio recording adhering to a “more is more” aesthetic. 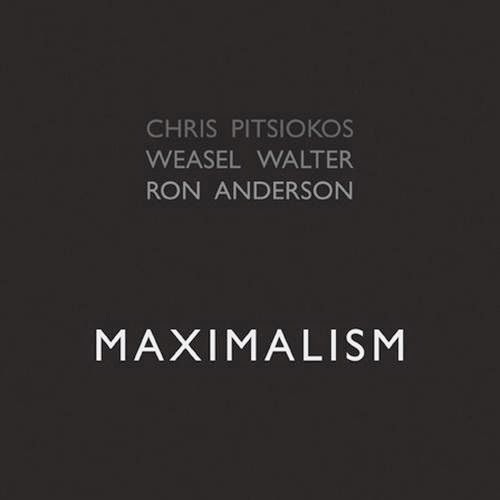 It’s no surprise at all that a record of that ilk should issue from the hands of the three musicians involved: Pitsiokos is a young Brooklyn-based saxophonist who lists, among others, Evan Parker and the early John Zorn as influences – musicians who aren’t necessarily known for their restraint. Weasel Walter – who happens to be on Pitsiokos’ list of influences as well, and who handles drumming duties here – is probably one of the most notorious “maximalists” in underground music, playing Free Jazz, Death Metal or all-out Noise with uncompromising intensity. With the Flying Luttenbachers, his main musical outlet for many years, he had made it his goal to replace the soft-loud dynamics, popular in many rock and jazz idioms, with a “loud-louder” dynamic. Next to this duo, guitarist Ron Anderson is the odd man out here. Not that his music – for example the albums produced with his excellent math-rock outfit Pak – has ever lacked intensity, but of the three musicians responsible for Maximalism, he’s the one who’s most likely to leave the listener room to breathe. Here, however, his penchant for spacious melodicism is for the most part overruled by his collaborators. So, what we have here is a one-hour-plus recording on the gnarly end of the free improv spectrum. With the exception of the quieter second track, which hints at Roscoe Mitchell’s groundbreaking Sound as a possible influence, the music rarely lets up in intensity. Since this dogged insistence on a maximalist aesthetic is not going to appeal to many listeners beyond those who are already converted, it’s necessary to emphasize the fact that this particular record is in many ways a reminder of how much fun free improv can be. Quite often, it’s a delight to simply listen to the bizarre sounds issuing from the trio’s instruments; beyond that, the fun consists in trying to figure out what may happen next, and in being surprised time and again – as in an old Roadrunner cartoon – by the sheer improbability of the (non-)resolutions. It’s as though the laws of nature were suspended for the record’s duration. In other moments, though, Maximalism sounds menacing rather than cartoonish: The sprawling 17-minute piece that is track 3 proceeds in a volcanic manner, spewing out white-hot chunks of sax- and slide-guitar-noise while Walter adds ramshackle double-kick patterns that sound as though a Poltergeist had hijacked his kit. In the second half of said track, Pitsiokos trades his sax for electronics to produce chirping and hissing noises that recall an excited R2-D2. It’s interesting to note that Pitsiokos lists, besides the more obvious choices mentioned above, John Cage as an influence. This may seem to be an odd choice at first, since Cage’s music has never been – at least as far as I can tell – as aggressively chaotic as this record; on second thought, however, it starts to make perfect sense, as Maximalism is clearly fueled by an attempt to obliterate any remainder of traditional musical coherence. There’s no all-seeing composer or musical “subject” controlling and overseeing the proceedings, no narrative arc in which the sounds are embedded as in an organic whole. Of course, this attempt was (and is) certainly not completely alien to free jazz practitioners, but Maximalism goes beyond the relative freedom of even the freest jazz record, eschewing, for the most part, chords and melodies in favor of an emphasis on sound as such. In this respect, Pitsiokos’ approach is Cage-ian indeed; he’s “getting rid of the glue” to liberate listening from conventionally “musical” expectations. @Colin: It's actually a well-established term by now, I guess mainly because "prog rock" has become somewhat unfashionable. Strictly speaking, it's not quite the same thing, though. So the two don't equate. Yup, the terms are often used synonymously, but math-rock is usually a more stripped-down and less self-indulgent proposition. I'm still a little puzzled: are they fractionally different, is one a sub-set of the other, or are the differences too many to enumerate? As someone who does math for a living, I was hoping it would be songs about math, but no luck. Sorry to have been such a square. I've read the article and think I've got to the root of it. I 'm rather partial to King Crimson, so it now all adds up. Will give it a listen.